Why is a Travel Medical Kit Important? The Best Backpacking First Aid Kit on The Market? 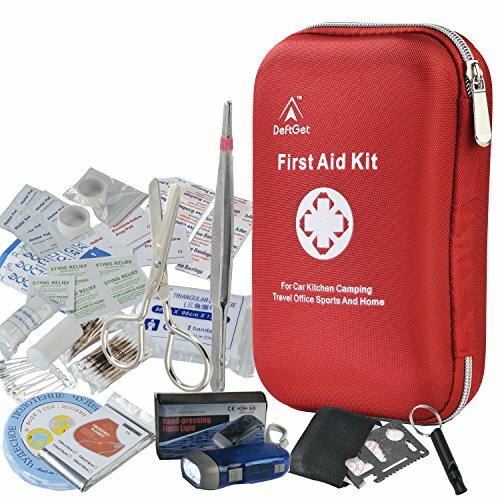 5 Best Small First Aid Kits on Amazon! The Cheapest Backpack First Aid Kit? When we talk about backpackers’ skills that one should learn before hitting the road, packing an all-rounder travel first aid kit doesn’t even feature in top 5. What generally outnumbers that are money-saving tactics like the art of bargaining and how to master the skill to book the cheapest flight. But many backpacker veterans would beg to differ! Because let us just accept: while weighing the allure of a remote village or a challenging hill hike, small accidents just don’t feature anywhere in our scheme of things. Sometimes we just dismiss in the back of our minds that the guides or the professional company organizing the experience for us will provide the emergency first aid supply. But have we considered that the medical supply might not be up to the standard? Some medicines might have expired? That non-professional handling might have contaminated the contents already? The answer to all your woes is: we should be equally equipped! While traveling through Southeast Asia or other parts of the world, you will almost certainly come across pharmacies. But they might not carry the medicine you are accustomed to. So the best way out of this is to either build your own personal emergency medical kit or buy one online with all of the necessary items required to treat anything from minor wounds to dehydration. Jump Down to See our Reviews of the Top 5 First Aid Kits on Amazon Here. You can avoid paying for unnecessary items that do not match your type of trip – who needs a thermal blanket when they’re going to Thailand? As you only take the essential items, it’s likely that it will be cheaper to build your own medical bag than buying one online. Building a first aid kit by yourself comes with a sense of satisfaction. You’ve taken control of one essential part of your trip planning! It’s super quick and easy to buy online. Endless trip planning can be tedious. After getting all your vaccines done, sorting out travel insurance and planning your itinerary, you may just be ready for someone to take care of the rest! If this is you, then you can have peace of mind for a minimal price tag. See our best options below. 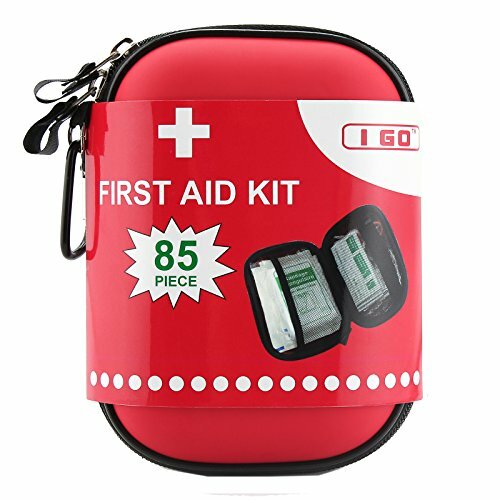 The small and compact first aid kits that you can buy on Amazon, for example, are packed to perfection meaning that they will take up minimal space in your backpack. They are not expensive. At the top of the range, the best travel first aid kits cost around $35 US, but it is possible to have a basic first aid kit for just $12 US. Check out our cheapest option below. You can have peace of mind knowing that all of the travel health essentials have been covered. You won’t forget anything, it’s all there when you need it. If you buy a medical kit online it automatically comes in its own bag that is sturdy, durable and waterproof. Plus, many of them have compartments so that everything is neatly arranged. If you decide to build your own medical kit then you’ll need to source a bag separately. The Best Bag for Your DIY First Aid Kit? Whether you build your own DIY first aid kit or buy a compact pack, having everything in a single waterproof bag means that you don’t have to fumble or fuss in case of emergency. A simple plastic bag just isn’t going to cut it, you’re going to need something durable and sturdy. If you’re set on making up your own first aid kit, then you can buy the empty bags on Amazon which cost just a couple of dollars. Given the tropical climate of Southeast Asia, any open wound gets infected fast if it is not cleaned pronto. So don’t forget to pack in some plasters, bandages, and band-aids as well as a disinfectant spray. Mosquitoes are ubiquitous! Keep a mosquito repellent lotion/spray along with malaria pills and thermometer to check first signs of a fever (e.g. dengue fever). The strong sun and summer months will leave you dehydrated quite easily – especially if you are venturing to open spaces during the daytime. It is advisable to keep hydration salts handy to beat Asia’s heat! As you create the list of required medicines and supplies according to the nature of your trip, don’t forget to make it personal. If you are a foodie about to indulge in the street-food extravaganza, do carry diarrhoea-stoppers! Climbing up the bendy roads of a mountain? Motion sickness pills should always grace your purse. Prone to allergies? Keep anti-histamines for sure! Wondering exactly what to pack in your travel medicine bag and worried you might have forgotten something? Let us help you. Here’s a list of the absolute essentials that you need in a backpacking or hiking first aid kit. Plasters – An obvious essential in any first aid kit to keep cuts and grazes clean. It’s best to have a variety of different plaster sizes, larger ones for more serious cuts and small blister plasters and strips for fingers and toes. Keeping wounds clean in Southeast Asia is so important as even the smallest cut can get infected in the hot and dusty climate. As you walk around in flip-flops with that cut on your toe, who knows what bacteria your wound could come into contact with. Gauze Swabs – Used as a dressing, to soak up blood or to help stop the blood flowing out of a wound, gauze is another essential item. Small sterile squares each in their own packaging is the best type of gauze for a backpacking first aid kit as you can just use them straight away without cutting them into shape. Bandages – For dressing and keeping larger wounds clean before you have the chance to seek medical attention, bandages are essential first aid kit items. You will only need one or two of these, as they are not very likely to be used and if you do use them, you can replace right away. Medical Tweezers – It makes me feel squeamish at the thought of it, but I’ve had several wounds that have required tweezers to clean. Small stones and gravel are likely to be present in cuts from falling off a motorbike and splinters will always require tweezer attention. You may use this item more than you think. Antiseptic wipes – Important for disinfecting cuts and wounds on the spot before you put a plaster or a bandage on. Yes, it will sting! A good handful of these in your travel medical kit are necessary as they are used quite often. Antiseptic/AntiBacterial Creams – As I’ve mentioned before, cuts get infected fast in Asia if they are not treated properly and antibacterial creams can help them to heal faster. Iodine ointment is common antiseptic in Southeast Asia or you may want to bring some stronger antibacterial cream like Neosporin for cuts that get infected. Medical tape/duct tape – For securing bandages and gauze. Can also be used to fix broken sunglasses! Safety pins – For securing bandages and holding things in place when attending to larger wounds. Vinyl gloves – In the effort to keep things clean, if you are dealing with a larger wound and you do not have access to clean water and soap to clean your hands, these will come in… handy. You only need one pair per medical kit. Hydration salts – One of the most used items from my experience are hydrations salts. In Asia’s tropical heat, it’s so easy to get dehydrated and these small sachets really sort you out! After a bout of diarrhoea, they are essential. Thermometer – Often one of the first signs that you are ill is an increase in your body temperature. Especially for tropical fevers such as dengue fever, a high temperature can be your first indication that something is not right and that you should get to a hospital fast. A normal human body temperature is 37°C (98.6 °F.) Anything over 38°C (100.4 °F.) is considered a fever. More on how to take someone’s temperature here. Painkillers – For headaches and minor injuries, it’s good to always have pain relief medication available, such as paracetamol. WARNING: Unless you are advised by a doctor, you should never take anti-inflammatory medications such as Ibuprofen or Aspirin while travelling in Southeast Asia. These medications have blood-thinning qualities which can be very dangerous if you happen to contract dengue fever and can lead to haemorrhaging. Read more here. Anti-Diarrhoea Tablets (E.g. Immodium) – Chances are, if you’ve never been to Southeast Asia before, at some point (usually at the beginning of your trip), you are going to get an attack of traveller’s diarrhoea. In most cases, this is not serious and as long as you dring enough water, rehydration salts (see above) and rest, then you should be fine within a few days. If you need to travel during this time, for obvious reasons, medications like Immodium can be useful. However, if your diarrhoea persists for more than a few days, you should see a doctor. Antihistamine cream and/or tablets – While you’re travelling in Asia you’re going to get bitten by different types of insects and you’re going to come into contact with different foods and different environments which could lead to an allergic reaction. Antihistamine cream is good for bites and rashes, while for something more serious, you may need to take a tablet. Even if you have never had an allergic reaction before, we reckon this is an essential medication to take as your body may react differently in new environments. Motion Sickness Tablets – If you’re prone to travel sickness, taking motion sickness pills with you will be at the top of your list. You’ll get your fair share of windy bus journeys and choppy waters in Southeast Asia! Anti-Malaria Tablets – It’s one of the most frequently asked questions for travellers to Southeast Asia – ‘Do I need Malaria Tablets?’ For most places, especially cities and towns in Thailand, Singapore, Malaysia and Vietnam, anti-malarials are not needed. Personally, I never take malaria tablets when I backpack in Southeast Asia as the risk of contracting malaria is very low. However, if you are travelling off the beaten track in parts of Myanmar (particularly South Myanmar) or Indonesia (particularly the east), then anti-malarial medication may be necessary. More info here, however, it’s best to consult with a doctor before you travel. Hand sanitizer – I always find it handy to have a small bottle of hand sanitiser with me at all times in Southeast Asia. At small restaurants and street food stalls, there isn’t always the opportunity to wash your hands before eating and having hand sanitiser is the only option. Altitude sickness tablets – In Southeast Asia, altitude sickness tablets are not needed as altitude sickness only really occurs over 3,000 metres. Apart from a few of the higher mountains, most of SE Asia lies at a lower altitude. However, altitude sickness medication will be something that you need to think about if you are planning to hike in Nepal or Himalayan regions of India. Water Purification Tablets – Depending on where you travel to in Asia, you may not always have access to clean water. If you are heading off the beaten track, especially in India and Nepal, then water purification tablets or iodine crystals may be necessary. Alternatively, you could invest in one of these smart water filtering bottles which remove bacteria and impurities from the water before you drink it. Apparently, you can even drink toilet water safely using one of these bottles – though I wouldn’t like to try it! Cold & Flu Treatment – Are you someone who is prone to colds, although there’s really no cure, having some medication with you while the symptoms pass will make your life easier. Multi-Vitamins / Probiotics – Some travellers like to build up their stomach prior to travelling in Southeast Asia and while they are away. If you have a particularly sensitive stomach or you want to build up your immune system you may consider adding some additional vitamins to your diet or taking probiotics. From my experience, it’s never been necessary, just eat all of the amazing fruit on offer in Southeast Asia instead! Birth control – The contraceptive pill is available over the counter in pharmacies in most countries in Asia, costing around $2 US in Thailand, for example. However, if you’re used to a particular brand from back home or you don’t want the hassle of trying to find a pharmacy that stocks your brand, then it’s wise to bring enough packets with you to last until the end of your trip. Condoms – It doesn’t need an explanation, but it’s wise for backpackers to have some handy! Thermal Blanket – While these wouldn’t be necessary for most backpackers to Southeast Asia, depending on where you’re travelling and what type of activities that you plan to do, a thermal blanket could be important to have. If you’re building a first aid kit for hiking then consider this an essential item. Most survival blankets are made of foil and wrap up into a tiny lightweight square so it hardly adds to the weight of your bag. If you get stuck trekking somewhere overnight then this blanket could save your life. Ice Pack – While not an essential item, these compact cold compresses do come in very handy if you contract a fever whilst travelling and can’t get access to real ice, or you have an injury that requires cold therapy. When it comes to finding the best first aid kit for backpacking, size and weight are the key factors. While you want to make sure you have enough of all of the essential items, you don’t want your health pack to be bulky and heavy and end up taking up too much precious space in your backpack! We scoured Amazon to find the best lightweight and small travel first aid kits on the market. The prices range from $35 US to just $12 US. A small price to pay for peace of mind while you’re on the road! 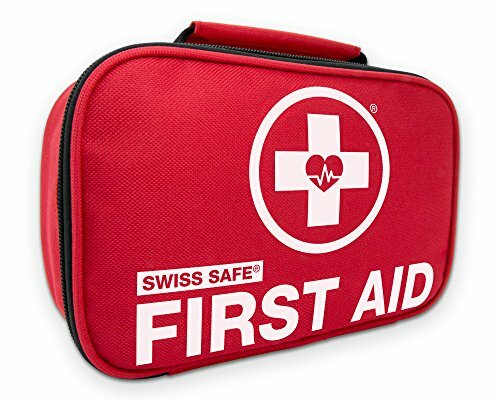 Swiss Safe 2-in-1 First Aid Kit packs in 120 pieces of medical grade items and a bonus of 32 pieces for a compact mini-kit that you can take away on your shorter trips. All the sterile items come with a minimum expiry date of 3 years to 5 years from the day of packaging and once a kit has been purchased it is good to go for the next three years at least. The best thing about this is that all products are latex-free, so people with latex allergy please take note! Also, it comes with a first aid guide that tells you how to treat injuries from minor cuts to heart attacks. What customers have generally loved about their purchase is that items are listed on the back of the bag which makes for an easy reading in an emergency situation. The sheer volume of medical items might overwhelm you at the beginning but you will thank your stars when the bag will save your day! The kit is FDA approved and contains an additional space to store your personalized medicines for travel. The bag is light and compact and every item is individually packed minimizing chances of any cross-contamination. One thing which could be bettered is weatherproofing the bag it comes in because although it is made of highly water-resistant nylon, it is not actually waterproof. 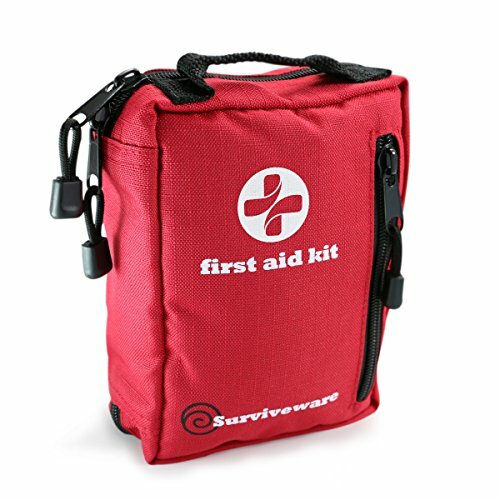 If you are looking for a durable yet lightweight bag which is waterproof then the Small First Aid Kit by Surviveware is the one you should pick up. It weighs exactly 1lb and measures 5.5 X 7.5 X 3.5 inches. The design is done thoughtfully and even though the outer material is waterproof, they have doubled the safety by creating laminated resealable inside pouches which make the contents also waterproof. Every individual inner sleeve is labelled to minimize confusion during the time of emergency. The bag carries 100 essential basic life-saving items and the company gives a lifetime guarantee on the bag. What we love about the bag is the insane amount of attention that has been paid in assembling the supplies. They could have easily piled up on the unnecessary to make a hundred, but no! And that’s where their expertise lies. The bag has straps and it can be attached to both belts and straps of a bigger backpack lending it a design convenience. Although some users did point out that the bag is so compact that adding extra medicines or a trauma pad (which is not included in their offering) might not be possible. Some companies invest in making a strong and compact bag and some care about adding quality content in addition to that. DeftGet does exactly that! The sturdy hard case ensures that the items inside don’t get squished under pressure and the size is an easy fit in any backpack. Also, it is waterproof! Starting from emergency blanket to hand-pressing flashlight, they have covered most of the basics that one expects in a travel emergency kit. The quality of their scissors and tweezers are really superior quality metal and are not flimsy at all. What it lacks is an ice-pack which is a minor injury essential, but you can always add it on your own. But the quality becomes a question if the kit carries a discount coupon of $5 for a 5-star review. To some, it may appear offensive, but to a select few it can be the company’s confidence in their superior quality and a gesture to reward loyalty. Some reviewers tell though that out of 163 piece kit, 80 of them are q-tips! But some other verified reviewers have applauded the fact that items comprise of the necessary handful of tools and bandages and wipes to take care of minor cuts and injuries immediately. Preparing for your ultralight backpacking trip and worrying about the additional weight of the first aid kit? 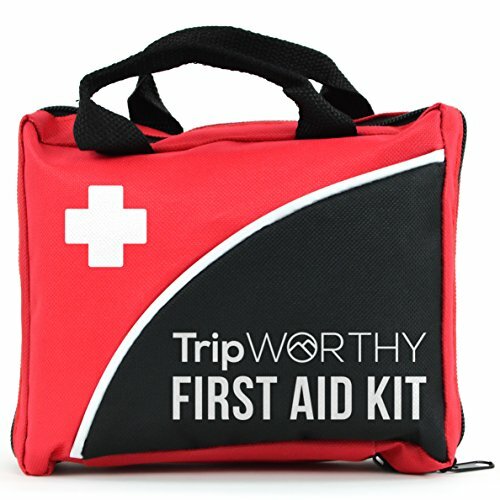 Rest your worries with this Tripworthy First Aid Kit. The pouch is small and compact and measures only 5.1 X 7.5 X 2 inches. The quality of items inside is top-notch as they are updated according to 2018 FDA standards. The items are an interesting mix of medical supplies and survival items. They have everything from abdominal bandages to CPR face-mask. The kit has an expiration date that will last you for the next four years! The customers have found this kit to be value for money as the bag is durable and quality of the items inside is premium. Given that the numbers of products are carefully chosen, the inclusion of a whistle and a poncho are highly appreciated by the buyers. The kit bag lacks the list of the supplies inside though. And another disappointment can lie with the fact that the items are not separately packaged inside the bag. Hence if you are in a hurry you might have to go through a pile of things to reach the required one. You know that you are in super competent hands when your outdoor first aid kit is designed by a U.S. Marine. Who can know better than them that quality will reign supreme any day over quantity? 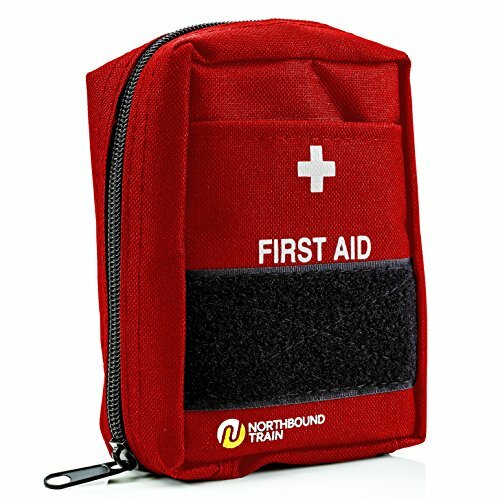 The careful curation of items in right quantity has ensured that the weight of the Northbound Train First Aid kit remains at 11 ounces and the bag measures only 3x5x7 inches only. Still, if you are concerned to fit it inside your backpack, the MOLLE compatible webbing and the belt loop makes outside mounting on your backpack a breeze. Customers are really happy with the quality of the shears and the sharp pointy ends of the tweezers and are of the general opinion that they alone make the price worthwhile. It is manufactured by a small company in Minnesota and they are extremely careful towards customer satisfaction. They are dedicated to making a mark in a market overridden by the big corporations with faceless and dubious services. Everything said and done, a few customers still said that the bag could have been made with waterproof or at least a water-resistant material since outside perch makes it more prone to weather damage during rains and snowfall. This pint-sized pouch packs a major punch! It is hard-shelled and waterproof and is perfect for backpacking and day trips. Cheapest kits run the risk of including not enough gauze as observed by many customers. But I Go Compact First Aid Kit stocks on plenty of those. And it comes with a lot of items which packs the bag so tight that it leaves very little space to customize it if you want. But you can always remove adhesive bandages and fill up space with your own meds. It has a clip on the outside and you can hang it from your backpack in case you don’t want to keep it in. It is very important to remember though that this is a starter medical kit and can help you to take care of minor scrapes and cuts. Though the quality of the bag is durable people commented that the zipper can be bettered. A few people also said that the bandaid size is more suitable for kids and the gauze doesn’t come with adhesive tapes to fix them. But to get 85 pieces of first aid product at this cost is a steal deal any day! For more health advice, see our guide on Vaccinations You Need for Southeast Asia.